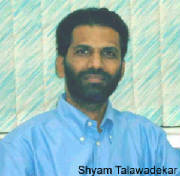 Shyam Talawadekar (1955): FAAAI Expert Faculty (on Industrial and Japanese Management) AOTS Japan. Founder, Chief Faculty at QMS, India. Director, Fleetguard Filters Ltd (a US multinational). Corporate Advisor to organizations to help implement quality approaches (KAIZEN, 5-S, TPM, TQC, JIT, Value Engineering-Analysis, Hoshin-Kanri, Standardisation, HRD Performance Management). Business Valuer. Written extensively on Japanese Management, inter alia, Authored ‘World of Kaizen', 1st 'Do-How' book outside Japan. Member Syllabus committee and Examiner (Production Engg courses, Bombay University). A graduate Production Engineer (VJTI) and Masters in Management (BAJAJ Institute) Bombay University, he groomed managerial skills in GODREJ and TATA. Shyam is a co-founder of our company.